Almost everywhere you turn in Granada there is a reminder of Spain’s Islamic heritage; in art, architecture and even in the vital waterways that irrigate the land. The Alhambra is of course the most famous and spectacular example of this legacy, but there is still a great deal more to the city for you to discover. You can find information on guided tours that include admissions and transport to and from your hotel here. The name Al-Andalus, which means ‘to become green at the end of the summer’, refers to the territories occupied by the Muslim Empire in Southern Spain (Almeria, Malaga, Cadiz, Huelva, Seville, Cordoba, Jaen and Granada); hence the name Andalucía. The Muslim empire in Spain spanned eight centuries from the Arab Conquests, which began in 711, to the reconquest in the 15th century. Within the first three years of their rule the Muslims or Moriscos, as they were referred to by the Spanish, occupied almost all of the Iberian peninsular; all except Asturias and the Cantabrian mountains of the North West. Under Islamic rule Spain flourished as a centre of learning and knowledge and it became a tolerant and multicultural society. Muslim artisans, masters of technique and design, applied their skills to the building of mosques and palaces. The Alhambra Palace and Great Mosque of Cordoba are two of best examples of the Islamic architectural legacy still standing today. Granada, home of the Nazrid Kings, was the last stronghold against the reconquering Catholic Kings Reyes Católicos, Isabella of Castile and Ferdinand of Aragon, who had married in order to unite their kingdoms and retake Spain. The city finally succumbed in 1492 when Boabdil, the last King of Granada, was exiled having signed a treaty to surrender. This date is perhaps more famous for the fact that it was the year that Isabella and Ferdinand awarded Christopher Columbus the funds to conquer the Americas. What followed was a period of what we would today describe as ethnic cleansing as Isabella lead a zealous ‘holy war’ to eradicate Islam from Spain. Muslims and Jews were forced to leave or convert to Christianity and many mosques were destroyed or converted into churches. Despite this the Muslim legacy spread throughout every aspect of Spanish life and is still very much in evidence today in the language, customs, art and music. 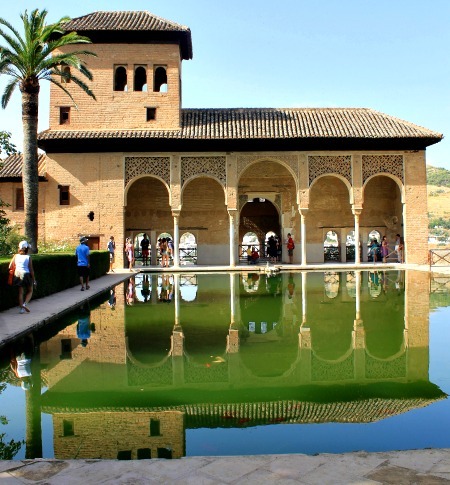 The palaces, fortress and gardens of the Alhambra, home to the Nazrid Sultans, offer the most famous and vivid reflection of Islamic splendour in Andalucía. No visit to Granada could be said to be complete without a trip to this fabulous monument, but it does require a bit of planning. For more information on buying tickets, how to get there, where to stay and how to get the most out of your visit, click here for our GranadaSpain Insider Guide to the Alhambra. If you enjoy fine art, be sure to allow some time to visit the Museum of Fine Arts Museo de Bellas Artes, located in the grand renaissance Palacio de Carlos V.
The Alhambra should also be admired from afar. Be sure to make your way up to Plaza San Nicloas in the Albayzín for the best views across the Daro to the Alhambra complex. From a historical perspective, the Gothic Royal Chapel Capilla Real at Granada Cathedral, which is the mausoleum of Catholic Kings Reyes Católicos, is one of the city’s most important monuments. Visitors can enter the huge Renaissance Cathedral, once the Great Mosque of Granada, for free but will find that access is limited when services are in progress. Housed in the adjacent offices of the Sacristy is a little museum displaying 15th century religious paintings, tapestries, and some fascinating personal items left by the Catholic Kings. Located opposite the Capilla Real is the 14th century Palacio de la Madraza, a former Islamic college. It was the first university in Granada and was well situated next to the Main Mosque, as it was then, and the Alcaicería. Now belonging to the University of Granada, it is dedicated to cultural activities and is the headquarters of the Royal Academy of Fine Arts of Our Lady of the Angustias. Opposite the Alcaicería you will find the well preserved 14th century merchants inn that latterly served as a theatre where you can still attend musical performances today. 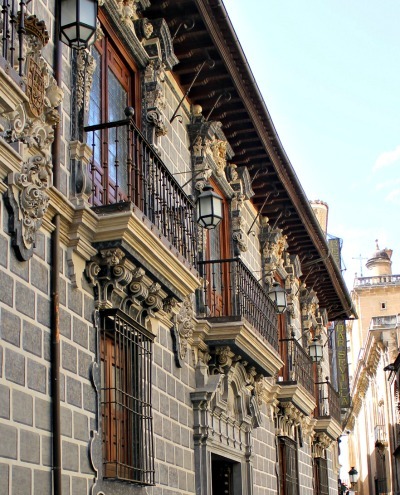 It offers one of the rare examples of Muslim architecture still remaining in Granada’s central district. Just off the Carrera del Darro is the 11th century Moorish bath house Baños Arabes which is one of the best preserved in Spain. Many public baths, such an important aspect of Muslim society, were destroyed by the conquering Christians who believed the practice to be excessive and heathen. You can also visit the nearby Hammam Baños, a modern and faithful reconstruction of the original baths, on Calle Santa Ana, 16 to experience this ancient practice for yourself. This lavish Baroque Carthusian monastry outside town was first commissioned in the 16th century but not completed until the 18th century. You enter through a cloistered garden off which are a number of small rooms in which you will find gruesome paintings of martyrs meeting their fates. The single-nave church, with the sanctuary and sacristy containing many works of art, is the highlight for Baroque fans. This seventeenth century church, which holds one of the most heavily attended evening masses in the city, is dedicated to the patron saint of Granada, Our Lady of Sorrows, and has a richly decorated interior. It is a center for a number of local Catholic processions. 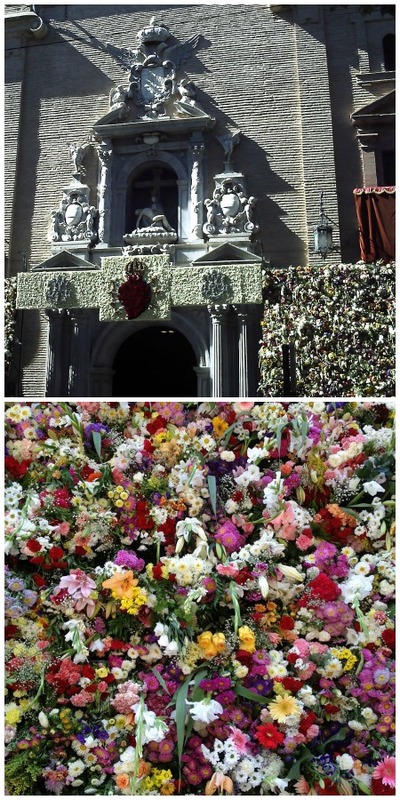 The month of September is dedicated to the Virgin Angustias and if you are in Granada on the 15th be sure to pass by where you will see that the church facade of is covered with beautiful flowers brought by devotees. Built in the 16th century over the former main Mosque of Albayzin, this Mudejar-style church retains a number of Islamic features but suffered damages during the Civil War in 1936. Only one tower remains of the Cuarto Real de Santo Domingo, an ancient palace once belonging to the Arab queens. After the reconquest of Granada in 1492 it passed into the hands of los Reyes Católicos who ceded it to the Dominicans and the convent of Santa Cruz. Later, in private hands, the building suffered greatly but sensitive restoration has taken place in recent years following re-aquisition by the city in 1990.